The State Minimum Wage Poster is a minimum wage law poster by the Oregon Bureau Of Labor and Industry. This is a mandatory posting for all employers in Oregon, and businesses who fail to comply may be subject to fines or sanctions. This poster must be posted in a conspicuous place where employees other then those of agricultural employers will see it. This poster describes what the Minimum wage is, information on general working conditions and the restrictions that minor employees must follow. It appears you don't have a PDF plugin for this browser. Please see the link below to download oregon-2018-mw-poster-with-tax-info.pdf. Umatilla, Union, Wallowa, and Wheeler. which  the  employer’s  business is  located. region in which the employee performs work. employer, over 44 hours a week. toward minimum wages owed to an employee. be provided with each paycheck. employers for at least three years. of a collective bargaining agreement. apply  to  persons  employed  as  domestic  workers. 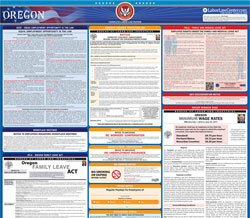 This is a summary of Oregon’s laws relating to minimum wage and working conditions. It is not a complete text of the law.